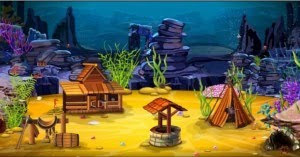 Fish Castle Escape is another point and click room escape game from 123Bee.com. In this game, an innocent fish has been jailed for the theft conviction of a “Precious pearl”. The objective of the game is to prove that the fish in the jail is not a criminal. Bring the culprit fish to justice by finding items and clues that leads to solving the puzzles as the game progress. So, use your cleverness to release the innocent fish. Here, the video walkthrough and step by step walkthrough guide is provided which will help you to complete the game easily and escape. Click on the Barrel to draw near which is found on the left side. Then, click on the Digging fish, Sea horse and Fish bone alternatively to collect it. Click and drag the Fish bone on the Barrel to crack it. Then, click on the Pearl to collect it. To collect stones which are present on the left and right side of barrel, click on them. Come back. Click on the well to get closer click and drag the digging fish close to the right side of the well. To collect stone which is found in the left side, click on the stone. Come back and click on the Coral reef to get closer which is neighboring to the well. Click on the shell which is concealed in the sea plant. Once again click on the shell to unlock it. Click on the pearl to collect it and come back. Click on the rock to get closer which is found in the right side back. Click on the Zebra fish to collect it and come back. The rocks are adjacent to the coral reef and click to get closer it. Click and drag the Zebra fish on the sea plant. Click the pearl to collect it and come back. Click on the jelly fish to get closer which is neighboring to the Sheriff’s house. Click it to collect and come back. Click on the jelly fish to get closer which is present in the right side, above the rock bed. Drag the jelly fish from the inventory panel to this view. Then, click on the big jelly fish to collect. Come back. To get closer, click on the octopus which lies near the right side of the camp. Click on the octopus to collect it. Come back. After that, click on the wheel to get closer. Click and drag the three stone on the wheel and collect the Tortoise. Give the four pearls individually to the Sea horse, Octopus, Tortoise and Jelly fish. Collect the four star fishes from each of them. Come back. Click on the Coral reef to get closer which is neighboring to the well. Click and drag the four star fishes on the Coral reef. One shell will appear and come back. Click on the red leaves to get closer which is present in the left side. Click on the leaves to collect it and come back. Click on the Coral reef to get closer and click on the shell to get closer. Click and drag the red leaves on the shell it will open. Click on the crab’s cave to get closer which is found in the right corner. Give the little crab to the mother crab. Collect the magical pearl and magical gel. Come back. Click on the Treasure chest to get closer which is present in the left side. Once again click on the Treasure chest and click and drag the magical gel on the chest to open it and collect the three diamonds. Come back two times and click on the camp to get closer. Click and drag the magical pearl to the solider fish. Click on the doorway of the camp to get in. Click and drag the three diamonds on the frog’s crown. Click on the magical potion to collect it. Come back twice and click on the well to get closer. Then, pour the magical potion on the well. A magical fish appears, click to collect it and come back. Go right. Click on the palm tree on the left to get closer. Click on the bubble to blast it and collect the Thorny fish. The shells are in both sides of the palm tree, click on it collect. Click on the fish bone to collect. Click on the coconut to collect and click on the stone which is present near the palm tree. Click the coconut from the inventory panel to unlock in the inner window. Use the stone to unlock the coconut. Click on the flamy fish to collect. Close the window. Come back. Click on the Octopus to get closer which is present in the right side. Come back click on the wooden tower to get closer. The shell and fish bone is found in the left side of the wooden tower, click on it to collect. Zoom out. Click on the candle to get closer which is found in the right side. Click on the shell to collect it. Click on the bubble to collect it and come back. Click on the pink Swirl plant which is close to the wooden tower. Click and drag the bubble on the swirl plant and collect the couch. Click and drag the couch on the Blue vacuum which is present in the left side. Collect the two diamonds and come back. Click on the wooden tower to get closer. Once again click on the doorway of the tower to get in. Click and drag the diamonds on the octopus head to collect the fish symbol. Come back twice and click on the Small sanctuary to get closer which is found in the left. Click and drag the fish symbol on the center of the sanctuary to unlock and collect the shell. Come back and click on the Thorny fish to open in the inner window and provide the fish bone to it which gives you a snail, collect it. Close the inner window. Click on the Flamy fish to unlock in the inner window and provide the fish bone to it which provides you a snail, collect it. Close the inner window. The green sea plant is present in the left, click on it to get closer. Click and drag the five shells on the plant and you will get a gel from it. Come back. Click on the Gel receiver area to get closer which is present near the top of the wooden tower. Click and drag the gel to the gel receiver then collect the Pebble. Come back and click on the fan to get closer which is found in the left. Click and drag the octopus near the fan and collect the shell. Click the shell from the inventory panel which came out from the fan. Click on the shell to unlock it and collect the Pebble. Close the window. Come back. Click on the tribal mask to get closer which in the left. Click and drag the snails on the eyes of the mask. And collect the Pebble and come back. Click on the wooden tower to get closer. Click on the top window of the tower to get in. click and drag the Pebbles to stick on the pebble reformatory to collect the magical fish. Click on the magical fish and click and drag another one to inner window then the Wand and Mermaid will appear. Click to collect it. Close the inner window and come back twice. Click on the cave which is present in the left side near the fan. Use the Wand to unlock the cave and get in. Click on the sea plant to get closer which is present in the left side. Click on the Fish bone, yellow fish and zebra fish to collect it. Come back. Click on the Yellow plant to get closer which is present in the right side. Click on the zebra fish to collect it. Click on the branch to collect it which is present in the right and come back. Click on the yellow fish, zebra fish and Octopus to collect it. Come back and click on the rope to get closer which is found in the left side. Click on the Tortoise to collect it. Click on the yellow fish to collect it and come back. Click on the path to get closer which is present near the left side of the Trunk base. Click and drag the fish bone to the center of the place and get the pot. Click and drag the three yellow fishes on the pot, one couch will appear. Click to collect it and come back. Click on the green sea plant to get closer which is present near the right side of the trunk base. Click and drag the octopus on the stone and collect the Sea heart. Click on the sea heart to unlock in the inner window. Click and drag the three zebra fishes on the sea heart then one couch will appear. Click to collect it. Close the inner window and come back. Click on the yellow plant which is present in the right side. Click and drag the Tortoise on the yellow plant one lamp will appear. Click and drag the branch to decant the potion on the lamp, one couch will appear. Click to collect it and come back. Click on the Sea shell sanctuary. Click and drag the three couches on the given place. Click on the white ball to open it. Click on the shell trap to collect it and come back. One light ray will appear in the left side Trunk. Click on it to get closer. Place the shell trap on the trunk and click and drag the mermaid on the trap. The Thief fish comes out and see the mermaid, then the mermaid ask the pearl to the thief fish. The thief fish carries the pearl to the mermaid. Click the pearl and the shell to collect. Come back three times and take left. Click on the Sheriff house and click on the Sheriff fish to get closer. Provide the pearl and the with the thief fish to the sheriff fish and prove that the Fish in the jail is innocent. To play Fish Castle Escape Game, visit onlinegamesociety.com.